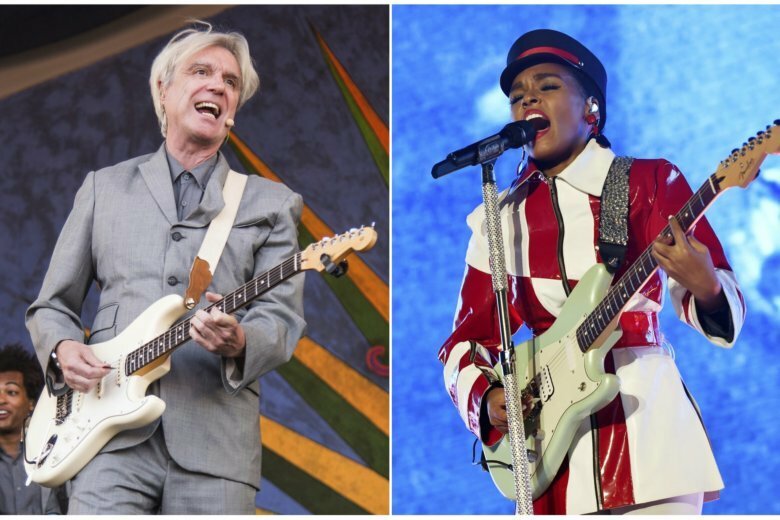 The Janelle Monae cover, “Hell You Talmbout,” is a rhythmic chant that recalls people like Freddie Gray, Trayvon Martin, Eric Garner and Sharonda Singleton. Gray died after a rough ride in a Baltimore police van, Martin was the Florida teen shot by someone who thought he looked suspicious, Garner died after being put in a chokehold by New York police and Singleton was killed in the Charleston, South Carolina, church shooting. It’s a bold choice for a 66-year-old white man playing to venues filled with people of a similar age and background. The former Talking Heads frontman is getting some of the best reviews of his career for a strikingly innovative show where he’s joined by a barefoot band that wears its instruments and is kept constantly on the move by whimsical choreography. Monae wrote “Hell You Talmbout” in 2015 and never officially released it, although video of her performing it circulated online. “Talmbout” is meant as a contraction of “talking about.” Byrne said he saw a stream of it and loved it instantly. Byrne, whose penchant for unexpected cover choices has included Whitney Houston’s “I Want to Dance with Somebody,” knew he wanted to perform it. He wrote to Monae, asking how she’d feel about an older, white guy taking it on. “If she had said, ‘hmmm, I dunno,’ I would not have performed it,” he said. Monae, who’s 32, gave her blessing. Byrne said he likes that it’s not a finger-wagging song. Byrne brings his show to a climax with Talking Heads’ songs “Burning Down the House” and “The Great Curve,” and the audience roars with approval. The reaction to “Talmbout” at a recent New York gig was notably quieter, although there was no audible hostility. Some audience members have seemed confused by it, particularly at overseas shows. Before the song begins, he often thanks Monae for letting him perform it, and update it with additional names. His one fear was that people would see the song as anti-police, but Byrne said he hasn’t seen that.